Is this wee boy one of the reasons Rangers won the league? 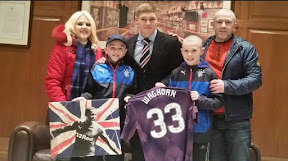 Cancer patient Lee Welsh turned twelve yesterday (Tuesday) and Rangers invited him to meet them as a special present before their league winning match. He was also a very special guest at their press conference last month. 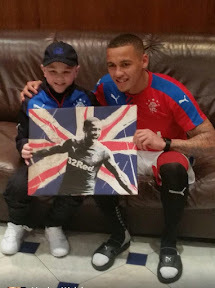 James Tavernier who scored gave him a signed print and Martyn Waghorn gave him a signed jersey. Lee from Larbert, who won boxing championships before being diagnosed with Non Hodgkin Lymphoma at the start of the year, said: "It was a really good birthday meeting the players and then watching them winning the league. I wished them luck before the game." He added: "I love football but want to be a boxer because it is so disciplined and keeps you fit. I'm not doing any boxing just now because I have to use my energy to fight this." Dad Richard added: "Mark Warburton has been brilliant and said any time you want to come up, just phone. Since the change in management Warburton is like a breath of fresh air and very welcoming. Lee has chemo so he has got to fit his visits in between that. He's had three bouts and is due a fourth. Now that Rangers have won the league hopefully he is seen as a lucky mascot."